A parish is a community of believers, part of Christ’s Mystical Body, from which flows grace and truth. The parish seeks to unite all of the faithful in Christ, to bring them closer to Him. An ethnic parish, like our own Annunciation, unites those of common language and tradition in a given geographical area in the movement toward Christ. Pope Pius XII, in a special constitution, gave us the ethnic parish as we know it today, and according to that constitution Annunciation Church has been operating with success in Brooklyn for many years. Other groups, such as the Germans and Polish, founded ethnic parishes before the Lithuanians, and Lithuanians attendee services in such parishes at first. After a time conflicts arose over matters of language, so the Lithuanians eventually sought to found their own parishes. The first Lithuanian parish in the United States was established in Pennsylvania [The first Lithuanian church (St. Casimir) was built by Father A. Burba in Plymouth, Pennsylvania, in 1889. In New York, Lithuanians founded their first parish in 1895 – St. Mary of the Angels in Brooklyn. Some years later, on May 5, 1913, a petition signed by over 1000 Lithuanians was presented to the bishop of Brooklyn, the Most Rev. Charles E. McDonnell, requesting that a new Lithuanian parish be established in the northern section of Williamsburg. The petition also expressed the desire to found a school next to the church. In 1914, Bishop McConnell suggested that the Lithuanians buy the church, school, and rectory built in 1863 by the then thriving German community, which had gradually dispersed throughout the city by that time. Although the buildings were not new, they served the purposes of the Lithuanians well. An agreement was reached with the owners of the property, and that same year the Lithuanians took over the Church of the Annunciation of the Blessed Virgin Mary. The most credit for the successful effort must go to Benediktas Scegauskas and J. Miliauskas. Living Rosary Society, Holy Name Society, St. Monica’s Widows Society, Perpetual Rosary Society, Catholic Youth Organization, Legion of Mary, Holy Name Juniors, Knights of Lithuania Council 41, the Third Order of St. Francis, the Lithuanian American Roman Catholic Alliance, Council 135 of the Altar Society, Altar Boys (about 30 pupils), ushers and others. It is believed that the parish incorporated about 2000 families at that time. Clearly the first twenty five years of the parish were creative and active. The parish priests, organizations, and the individual parishioners gave evidence of their deep desire to promote their religion and their culture. Their faith and dedication left a permanent mark in the history of the community. By the time the parish celebrated its 60th Jubilee, much had changed. In place of the many previously active organizations, the parish could boast of relatively few – the choir, the Knights of Lithuania Council 41, The Lithuanian Catholic Women’s Society Chapter 29, the Lithuanian Community Council and the Parish Council. Though the numbers of active organizations had greatly decreased, the surviving ones continued to play an important role in parish life. Faith and dedication remain alive in our current parishioners. If all of them and especially the young people, can recapture the enthusiasm of the parish’s early days, then our parish will be with us for years to come. Our hope in the breaking of the dawn remains alive, a dawn that will break into the beautiful rainbow colors of the religious and ethnic experience of our people, if we but have faith in ourselves. This page was authored by Petras Palys. First photo on this page: The altar of Our Lady of the Dawn Gate, AUSROS VARTAI, also called Our Lady of Vilnius in English. 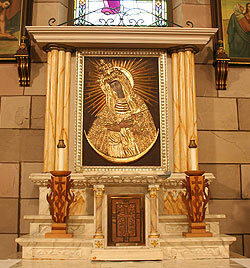 This altar piece was rescued from the now closed St. George Lithuanian Parish Church, Brooklyn. 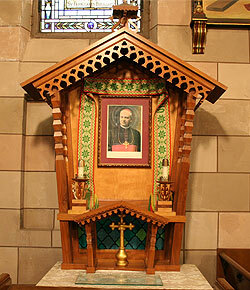 Second photo on this page: Blessed Jurgis Matulaitis Altar, Carved by parishioner Charles Visotsky.